Displaying results 1-2 of 2 titles for "Judy Chicago"
When Judy Chicago's multimedia exhibit The dinner party opened in the 1970s, it was hailed "an icon of feminist art" (ARTnews) and was seen by nearly one million people. Now, in a book of the same name, she celebrates the re-opening of the exhibit in Los Angeles later this year, Chicago updates the themes, interpretation, and history of her landmark exhibit. A preeminent artist, author, feminist, and educator, Judy Chicago's work and life have been devoted to expanding women's presence in the arts and in art history. Her art is frequently exhibited in the United States and internationally. The dinner party is her best-known work. Many consider Judy Chicago one of the most influential artists of the last fifty years. The impact of her work extends throughout the international art, feminist, literary communities--and beyond. Her majestic 1979 installation The dinner party is recognized as a masterpiece of the twentieth century. Chicago has authored seven books including Through the Flower. Chicago lives with her husband, photographer Donald Woodman, and their numerous feline companions in Belen, New Mexico. "For more than a decade, Judy Chicago has been formulating a critique of studio art education, in colleges or art schools, based upon observation, study, and, most importantly, her own teaching experiences, which have taken her from prestigious universities to regional colleges, and across the country from Cal Poly Pomona to Duke University and the University of North Carolina, Chapel Hill. Creator of the celebrated The dinner party, a monumental art installation, Chicago reviews her own art education, in the 1960s, when she overcame sexist obstacles to beginning a career as an artist and became recognized as one of the key figures in the dynamic California art scene of that decade. She reviews the present-day situation of young people aspiring to become artists and uncovers the persistence of a bias against women and other minorities in studio art education. Far from a dry educational treatise, Institutional Time is heartfelt, and highly personal: a book that has the earmarks of a classic in arts education." Born in 1939 in Chicago, she moved to Los Angeles in 1957 to attend UCLA art school, where she was graduated in 1962 Phi Beta Kappa. In 1964, she received her MA from UCLA in painting and sculpture. In 1966, Chicago's work "Rainbow Pickets" was shown in "Primary Structures," a major minimalist exhibition at the Jewish Museum. In 1970, Chicago founded the first Feminist Art program at California State University at Fresno. A full page ad in the October 1970 Artforum announced Chicago's name change from Gerowitz. The ad says she made the change to divest "herself of all names imposed upon her through male social dominance...". Judy Chicago is most famous for her 1974-1979 work The Dinner Party. This work, in which hundreds of volunteers participated, has been housed since 2002 in the Brooklyn Museum of Art. It was donated to the museum by The Elizabeth A. Sackler Foundation. It is now permanently housed at the Brooklyn Museum within the Elizabeth A Sackler Center for Feminist Art which opened in March 2007. It is a homage to women's history in the form of a large triangular table with symbolic ceramic plates representing 39 famous women guests-of-honor. The work is intended as an elevation to heroic scale of the contributions of women in a way that has been excluded throughout history. 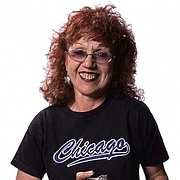 Judy Chicago is currently considered a "single author." If one or more works are by a distinct, homonymous authors, go ahead and split the author. Judy Chicago is composed of 2 names. You can examine and separate out names.